Most St Patrick’s Day celebrations involve a lot of Guinness and even more people wearing every shade of green in existence. Last year, mine involved neither–although some of the people with me may have been wearing green under a multitude of other layers designed to keep them warm in the -20ºC temperatures. And, instead of doing the partying ourselves, we let nature do it for us as it created the greenest sky I have ever seen. 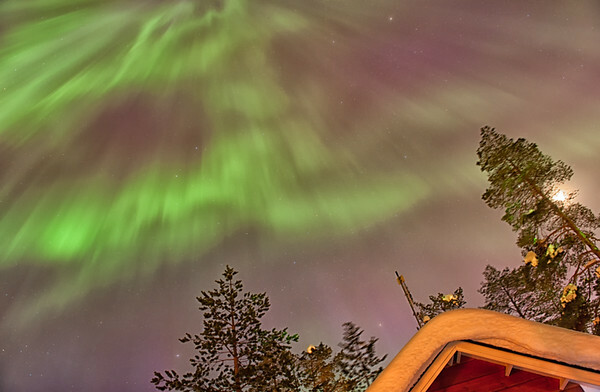 The corona I saw above the cabins of Ounasvaaran Lakituvat. 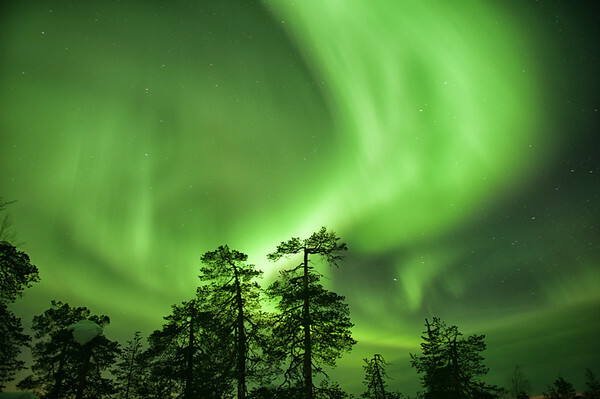 While aurora forecasts may not always be accurate–and seem to cause more disappointment than happiness in the grand scheme of things–I chose to believe the aurora forecast I saw on the morning of March 17. It predicted that a geomagnetic storm would be hitting that night and would lift the Kp level (an indicator of how low the latitude of the expected aurora will be) up to 7 out of 9, which by far the highest Kp I would see on my trip. 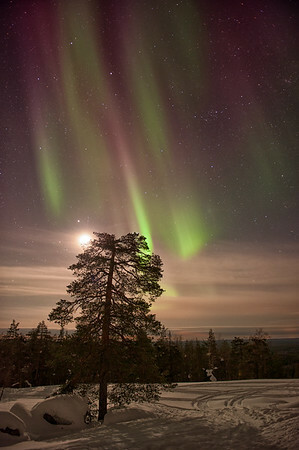 Unfortunately, I was also based in one of the largest cities on my trip through Lapland (Rovaniemi in Finland) which meant I would be watching the aurora in a sky dulled by light pollution. 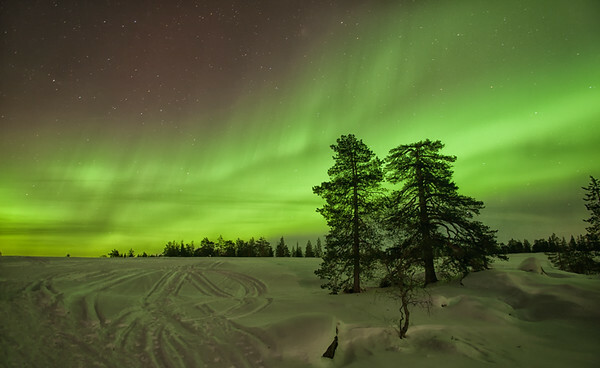 Luckily, not everyone in Rovaniemi had read the forecast because Lapland Welcome, a tour company that takes people far away from the city lights to have a clear view of the northern sky, still had spots on their Star Safari tour to Kätkävaara, a nature reserve in what is best described as the middle of nowhere. For €79, they would pick me up from my accommodation, provide all the warm outerwear I would need for the frigid winter temperatures, and drive our small group an hour away from the city to Kätkävaara. A big smiley face in the sky. Can you see it? I knew we were going to be in for a treat when I walked out my front door at Ounasvaaran Lakituvat and looked up. The sky was exploding into colour, with greens and pinks seemingly raining down from above. Just above my head was an auroral corona, a phenomena that looks almost like a crown on top of the sky–except that the crown seems to be pulling in the auroras from all around it! The only light pollution we could see made it look like the aurora was igniting. Pretty cool! It’s hard to explain how difficult it was to pull myself away from that site and walk to the pick up point, or how much I cursed myself for booking a bus trip out of town and possibly missing the best part of the show right on my doorstep. The show continued though. 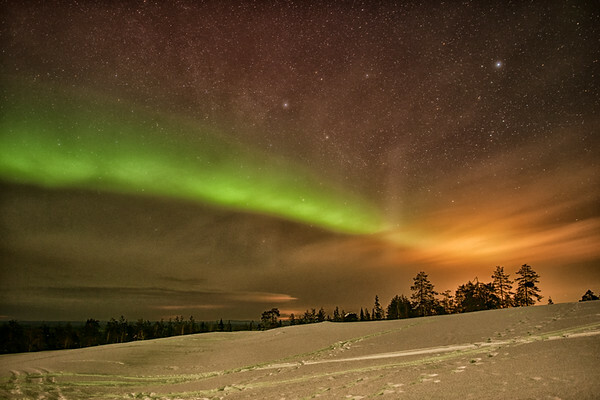 From the centre of Rovaniemi, even with city lights towering above us, we could see green arms reaching from the horizon far across the sky. This was definitely going to be a good night! 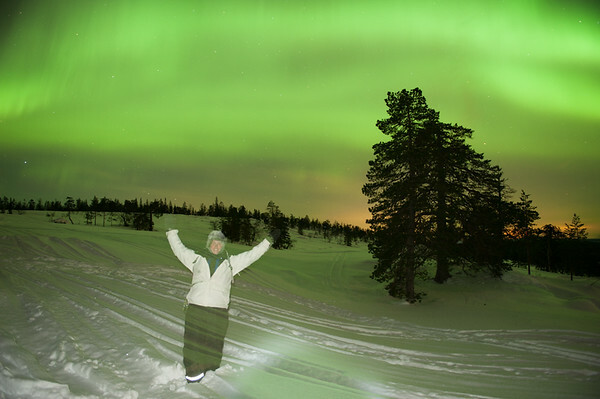 A few photographers on our tour try to nab that perfect aurora shot (it’s harder than it looks)! 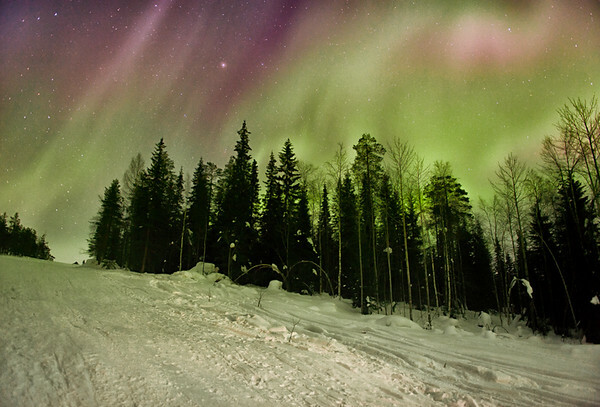 For the entire bus ride out there, we oohed and aahed as auroras blazed across the sky. That was the easy part of our trip though; the hard part started as soon as we got out and were directed towards a hill that looked rather steep and entirely too covered in snow to easily hike up. That was our destination though; a hilltop with a promised 360º view. We just had to make it up there. Standing at the bottom of the hill looking up (this was taken at the end of the night as we were being dragged back home). I was feeling pretty in shape by this point in my trip, but it didn’t prepare me for having to dig myself out of the thigh-deep holes I kept sinking into as I made my way up the hill. What would have been an easy 10 minute walk in summer became a bit of a slog, but all we had to do was look at both the gorgeous Finnish forest rising around us and the sky beyond that to know that it was all going to be worth it. My favourite scene from the night. At the top, our guide pointed us towards a small wooden hut that would be our oasis for the night; anytime the -20ºC cold really started to bite, we could huddle in the hut next to a roaring fire with a sausage roll and a hot cup of tea. 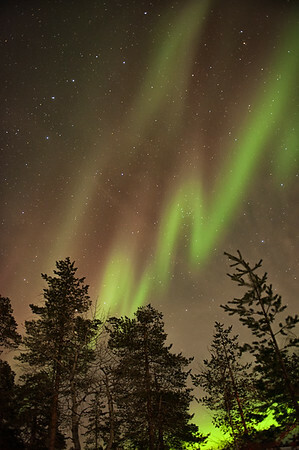 He also pointed out the northern sky, where we could expect to see the aurora (although it seemed to have gone on a break as soon as we arrived at Kätkävaara). It was only then that the lights appeared again…and so strong that they were actually in the southern sky instead! Our little oasis of warmth at the top of the hill in Kätkävaara. We passed hours up on the hill, and I spent very little of it inside the hut, preferring to deal with a bit of cold than miss out on any of the show. Fortunately, I’d brought more layers than recommended so I could just keep piling on the clothes. No one minded the Michelin Man look since they were all looking at the sky anyway. As for the show, it’s hard to put into words. Majestic, mind-blowing, awe-inspiring, and perfection all come to mind. The colours fluctuated; always green, but sometimes surrounded by a blanket of pink, and other times with a hint of purple and gold. 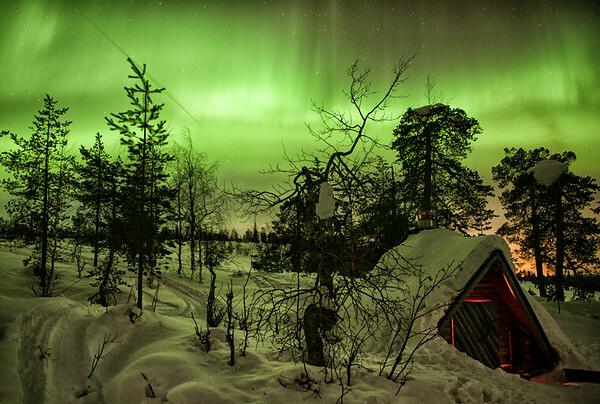 The aurora swirled across the sky, with massive ribbons stretching almost as far as we could see in either direction. 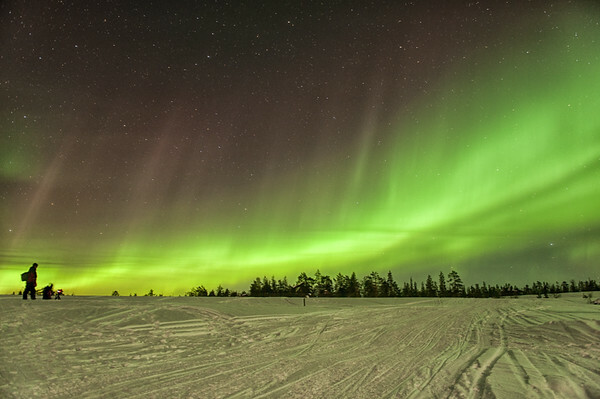 The individual lines that make up each band in the sky, which look a bit like an audio wave and seem to vibrate up and down the length of each larger wave, danced as only the northern lights can. I often found myself putting down my camera and just standing transfixed. It kind of felt like the sky was falling on us as we watched this. Sometimes it was easier to stand and stare as well, since the alternative was to move around on the snow. In most places it was fine, but sometimes I’d find myself face down in the snow without really knowing what had hit me. My crowning achievement? Setting up a shot where I could stand in front of the northern lights, only to fall over just after the flash went off. I’m still in the photo, but I look like a ghost because I wasn’t in the same place for the entire exposure. Look Mom, I’m a ghost (because I’m clumsy)! 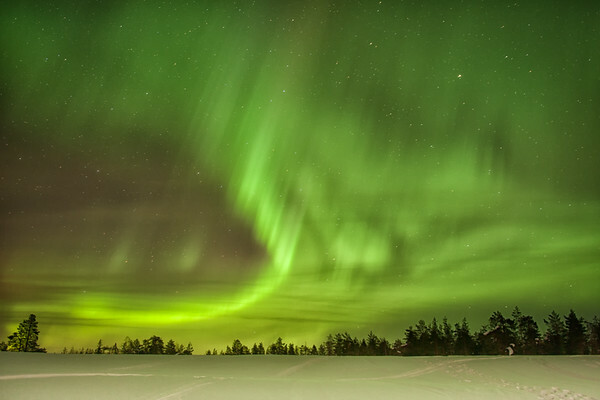 Just as we were being herded back to the van (due to the fact that Lapland Welcome’s insurance apparently runs out at 2am and we were barely going to make it back as it was), the most spectacular aurora of the night appeared above us. It morphed and spiralled around the sky so quickly that it was hard to keep up with everything that was happening. It was such a brilliant green that everything around us began to turn an emerald colour as well. Even our guide was stopped in his tracks and let us have 15 minutes of gawking time before we were goaded back down the hill and into the van. Taken just before I gave up on using my camera and just stared instead. That night, my head hit the pillow after 3am and I had a breakfast planned for 8am. That sleeplessness was absolutely worth it–just as much as it had been when I stayed up half the night in my glass igloo a few nights before. 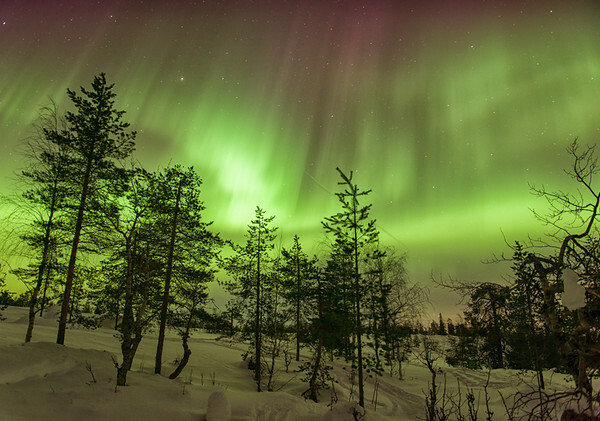 I’d seen a truly extraordinary show in all its colourful glory, and that alone was worth the sleepless night, the cost of the tour, and even the cost of my trip to Lapland as a whole.